General Hospital (GH) spoilers reveal that Sarah Joy Brown (ex-Carly) is speaking out again. She’s fired up about sharing her story and warning others in the entertainment industry. Brown’s been making some serious accusations over the past few days. Some of those accusations involve major network soaps, the execs behind them and even costars who allegedly chose to stay silent. Brown tweeted about unfair experiences she faced at The Bold and the Beautiful, Days of Our Lives and General Hospital. She insisted that she was fired unjustly thanks to an internal memo at B&B. She also claimed her computers were hacked on the lot at Days of Our Lives. Brown complained, but was ultimately written out of that role as well. Brown had some issues to share regarding General Hospital as well. She’s best known for the role of GH’s Carly, so it’s been an important part of her Twitter confessions. Brown previously tweeted about being paid far less than Steve Burton (Jason) and Maurice Benard (Sonny). She was livid over it, especially after she picked up three Daytime Emmy wins that brought clout for the show. Now Brown’s going after another former costar. She called Vanessa Marcil (ex-Brenda) out for refusing to support her after Haim Saban, a media proprietor and billionaire producer, allegedly did her dirty. Brown wanted to make her accusations public and presumably shame Marcil for not having her back. Brown ranted about a longtime vet at GH who wouldn’t stand with her. “…She was like family to me, but she declined, saying her husband was now in business w/my abuser, & husband asked her not to assist me.” Brown offered forgiveness to this unnamed costar, but indicated that she’d still like this woman’s support. Tweets are still pouring out regarding other primetime gigs and sexual assault allegations. Brown recently retired from acting, which means she may feel like she has nothing left to lose. She’s putting it all out there and letting people know what she was allegedly up against. General Hospital spoilers indicate that more shockers are ahead in Port Charles, but Brown’s bombshells are the talk of the town today. 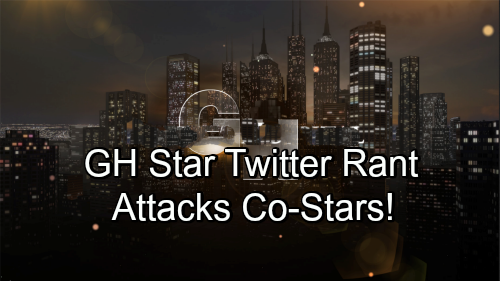 We’ll give you updates as other GH news comes in. Stick with the ABC soap and don’t forget to check CDL often for the latest General Hospital spoilers, updates and news.